Am a day behind but Day 27 of the 30 lipsticks in 30 days project features Rimmel of London found in Watsons. 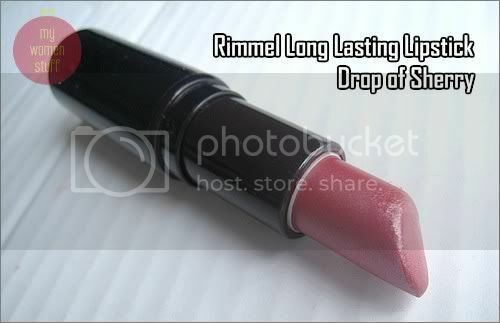 Rimmel Longlasting Lipstick was my first ever Rimmel lipstick and came all the way from London. This was in the days before Rimmel was available in Malaysia. The longlasting lipsticks live up to their name. They do last and they don’t dry out the lips. The colour payoff is good and you pretty much get what you see. Unlike the Gloss Maxx lipstick, it isn’t as glossy or shiny. Drop of Sherry is a red straight and true. It does not go on with any drama unlike all the reds I featured at the start of this series. Its a bright colour but one I find wearable for days when I want a red lip without scaring everyone I meet. PREVIOUS POST: New Coach Poppy Bags – Hit or Miss? ooh that red does suit you! And I think the Rimmel lippies smell of bubblegum. I don’t love it, but I don’t hate it either. Yay! This is a pretty shade yes?